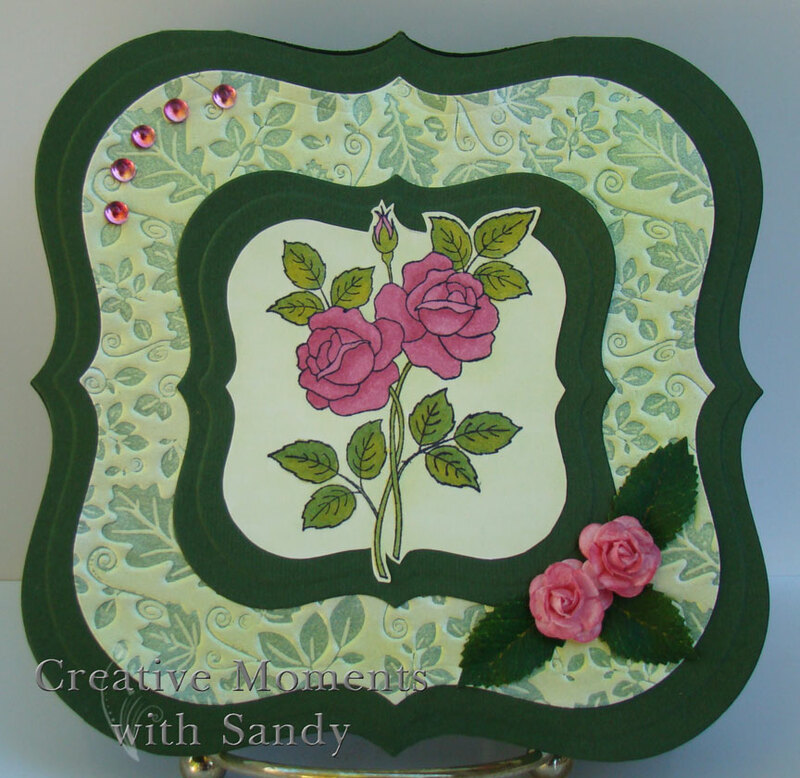 The Stardreams paper was an off white which is why I added the background around the roses with G20. But then the background was too green, so I simply airbrushed YG01 onto the Stardreams foliage embossed panel and everything matched. I also airbrushed both the roses (Prima) and the gems to match with R85. The shimmer from the Stardreams paper as well as the Cryogen I stamped on really makes this card beautiful. SweetStamps is now carrying cutting dies and embossing plates from Dies Direct. These dies are heavy metal dies and unlike other companies which are made in China, these are made in the USA. 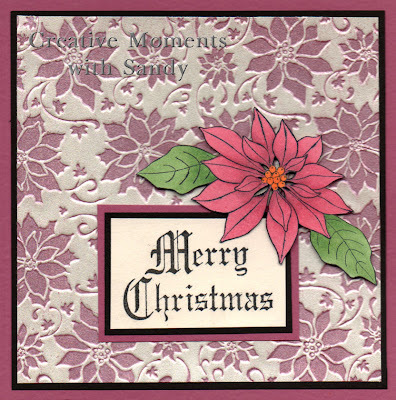 For this card, I have used my new E129 Poinsettia embossing plate, it will emboss an area that is 5-7/8 x 7-3/4 inches. So you could make a background for a 6" square card with no seams. Incredible! I cut out the poinsettia and popped it up above the sentiment. Finished size is 5.5" square. Welcome to the official SweetStamps blog (FINALLY)! I've only been wanting to get this started for a year or two now, but as you may know I've been on a bus with the family traveling from trade show to trade show in a different city each week. The purpose of this blog will be to share exciting news, samples, specials, products and techniques from SweetStamps.com and many talented ladies who love to stamp and paper craft. I have always believed in educating our customers which is why we're traveling the rubber stamp show circuit to bring our company to a city near you. In 2011, I hope to be able to teach classes at each convention or a nearby store. I'll be counting on you, our valued customers, for some insight to make sure we are giving you what you want in terms of product mix, education and value. Please feel free to email any suggestions or comments to me at info@sweetstamps.com. When you see a link in a post (like this: www.shop.sweetstamps.com) clicking on it will open a new window and take you to our store site to make ordering easier. You can also link to our store by clicking on the SweetStamps.com logo in the upper left side of this blog.